You know Hercules? The guy who did the twelve impossible things? Well there were some things even he didn’t attempt. Nobody ever asked him if he could, just once, get the kids into bed at a reasonable time, without making an absolute drama of it. You know how it is, well, some things are just impossible, right? But we have a solution for you. Not just one, not just two, not even three – but, nine! Yes, nine, bedtime stories all in one book! All these stories have been thoroughly field tested on my own grandchildren, to make sure they come up to par (they have also been vetted and passed by my daughters as suitable for bedtime – that’s category B). Pop over to http://www.everopenstorybook.com – where the free story of the moment is The World of Wobbles – and read how Intergalactic, Super Space Hero Fin Lightning saved the Universe from the worst Trifle Shortage in living memory. When we wander off on our daily dawdle, in search of the vim and vigour that is purported to go with bodily well-being (although, to date, we have no supporting evidence), there are certain conventions that have to be observed. There is the level crossing, for instance. Here, we need to pause and consider – before we turn round and head for home. It was during this considerate phase of our walk the other day, that the camera and I were taken quite by surprise. The level crossing lights started to flash, so we turned to watch the train go by, expecting our normal, bucolic, two coach bus-on-train-wheels to trundle past. But, indeed no. It was one of your super high-speed, Intercity, pointy-nosed, all singing, all dancing, high class girls. I felt quite embarrassed. What on earth possessed her to try to get to Newcastle through our short cut? I shudder to think what the brambles in the field did to her stockings – and how she got over the stile in that skirt, I can’t imagine. As for trying to negotiate that bit by the beck in high heels, well! The camera and I were quite flustered, but we did manage to get the lens cover off in time to to take this picture of her rear end, disappearing round the corner. It’s not often we have such a close brush with celebrity. 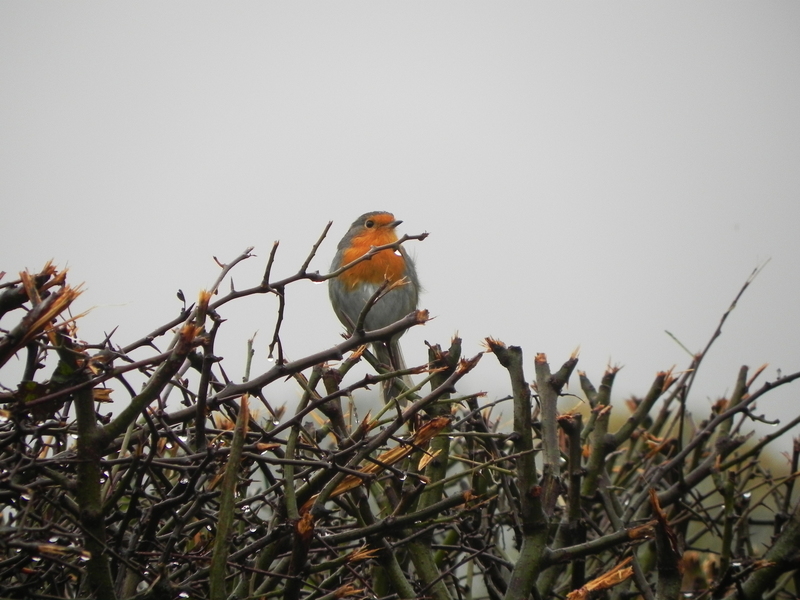 We bumped into The Robin on our way round the other day. He was looking very cheerful – in spite of singing that mournful dirge of his. I mentioned to him that it was hard to take him seriously – all that pseudo-sobbing and heart-rending pathos – when he bounces by with a smile on his face and a glint in his eye. As Hallowe’en is over now, (although, there are still a couple of pumpkin heads sitting in front of one of the houses on our route – the party was so good that they missed the last broomstick home, we suspect) he has a few weeks to himself, before he needs to decide which holly bush to sit in, and take up his ritual Christmas obligation – so he was relaxed and in a communicative mood. We chatted for a good few minutes before he mentioned a previous appointment, and said he had to fly. The upshot of it all was, I have sadly misjudged the fellow, I apologised profusely, of course, and he was good enough to dismiss the matter with a careless flick of his tail. It seems that he has made somewhat of a name for himself in the Northern Soul world, so he takes every opportunity to practice whenever he thinks he’s alone. It requires focus and attention to detail, he assures me, to fake authenticity. There has been some research in China showing that, when moisture interacts with the silk of a spider’s web, strange things happen. 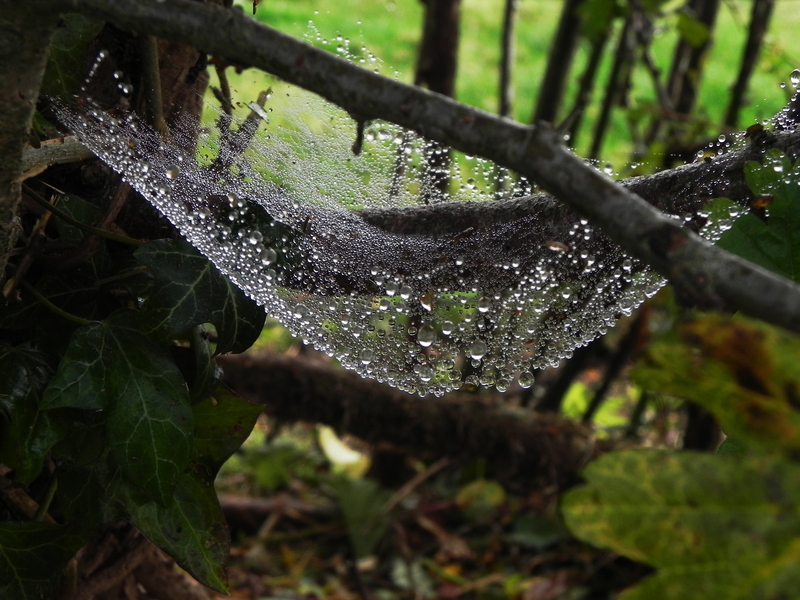 The strands of silk change and actually trap and hold the moisture, directing it down towards a node in the spider’s web, a place where two strands intersect. The silk at these places, where two strands cross, acts quite differently. At these nodes the moisture changes the silk to a state that rejects water, allowing the dew collected by the strands to form droplets and drip off. So, if you lived in a desert with lots of fog, which a surprising number of people do, you could set up a fine mesh net and collect your drinking water at dawn, when the fog rolls in off the sea. The nice thing here, is that the fog and the net do all this without any form of human intervention. This means that there is no need for anyone to get up at those unearthly hours, often referred to as Early Morning, to make sure all concerned turn up on time. As it happens, while we have plenty of fog, we don’t live in a desert. In other words, “We have the technology” but . . .